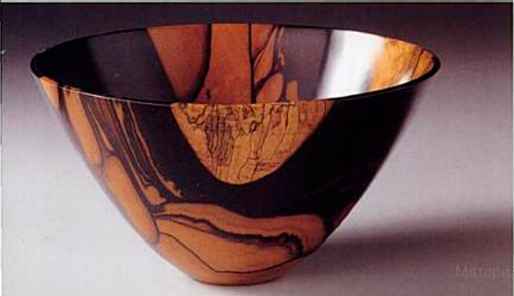 "Hie wood bowl is an objcct that has been utilized for centuries by diverse cultures. As part of our everyday IKes.it is so familiar to us that it can easily tie taken for granted Yet. 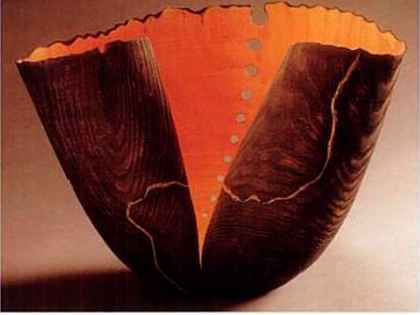 for contemporary artists who work in wood, the bowl represents a form with tremendous potential, from revealing the beaut)- of nature to sliming an artistic vision or conccpt. 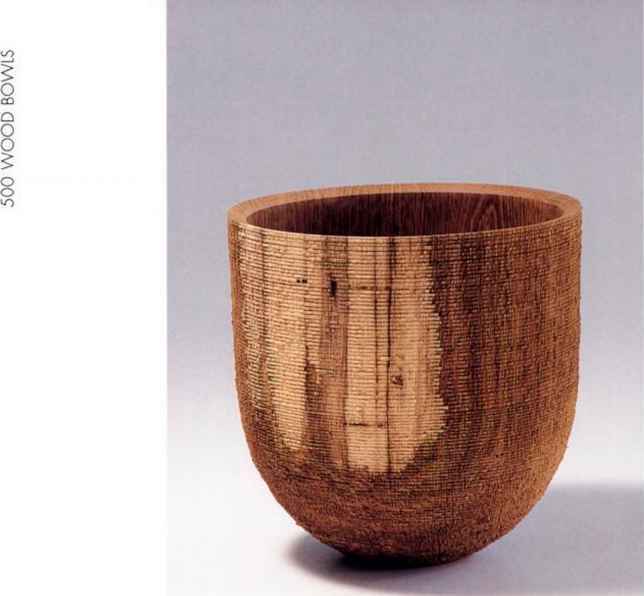 Over the last few decades, the wood bowl has been reinvented as an artistic medium and is today approached by artists and craftspeople all over «lie world as both iconic form and point of departure for self-expression. 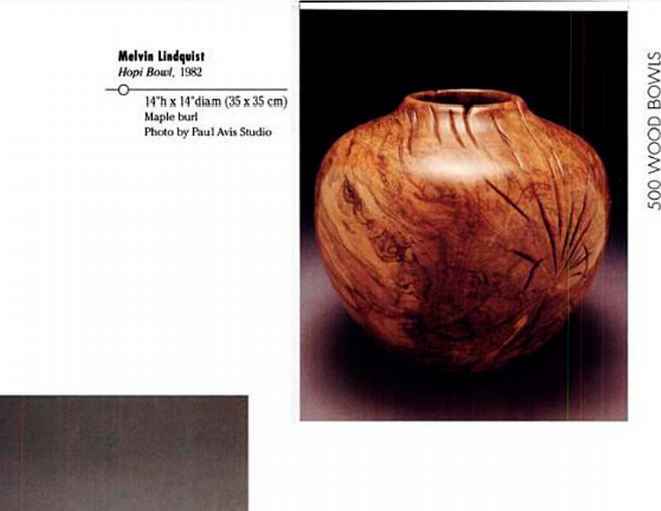 Many of the bowls in this book are related to the woodturning movement that grew out of a number of pioneenng artists working in different regions, ¡aspired by wide-ranging approaches.They include a member of the Chicago Bauhaus, James Prestlnl.who has been credited with the birth of this new art form; Bob Stocksdale, who retired the turned wood bowl in bus Northern California workshop over five decades; Mel Lindquist.who was creating hollow vessels on the East Coast; and Rude Osolnik, who lived on a mountaintop in Kentucky and took a folk-craft approach to the vessel. 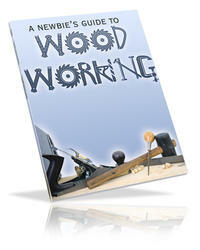 level, creating now standards and pushing the cralt into the realm of art. 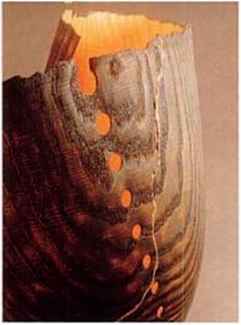 Over the las* two decades, a number of artists became part of this new movement,contributing more ideas and pushing the f ield ahead. 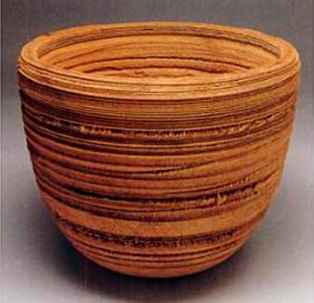 Along with the potential to create thinner, more complex forms, technical breakthroughs haw allowed wood artists to create vessels. 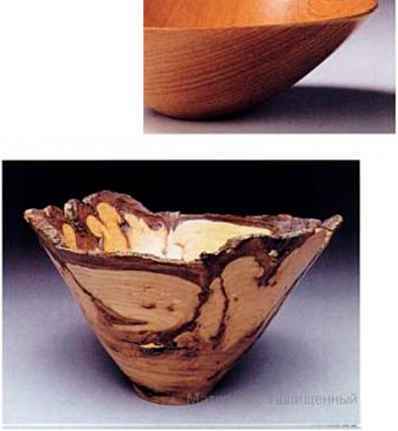 Since wood can't be used to hold liquid,these forms made little sense as vasej.Yet these new forms expanded the language, just as lids offered the potential of container forms.While being expanded upon in relation to utilitarian forms, the wood bowl also came to Ik* abstracted and deconstructed, offering an excellent point of departure for sculptural pursuits. O utilitarian purposes and artist exploration,featuring artists crucial to the development of the contemporary approach and the best of a new genera-O tion of artists who continue to explore it.Tlie work in this lx>ok is. indeed, vn the stale of the art.